Ashtree House Bed and Breakfast01274 834805work Bed & BreakfastAshtree House offers two double bedrooms and traditional English breakfast using locally sourced produce. The house was built in 1863, originally as a country inn run by the Thwaites family. It remained a hostelry until the late 1930s when it changed use to a residential property. The current owners Bev and Chris Hughes have lovingly updated their home to provide high quality bed and breakfast accommodation, whilst still retaining the traditional Victorian features. Ashtree House is located on the edge of the village close to the wonderful un-spoilt Yorkshire countryside and moorland made famous by the Brontë novels. Thornton village boasts the Brontë birthplace -now an Italian style coffee shop called Emily’s - as well as an arts and craft centre at South Square, with its own gin bar and vegetarian cafe. There are several local hostelries and eateries that serve high quality food. The property is close to Halifax (6 miles) with its famous and recently renovated Piece Hall and to Haworth and the Brontë Parsonage. For those visiting the area on business Ashtree House is conveniently located for access to the M62 (10 miles). 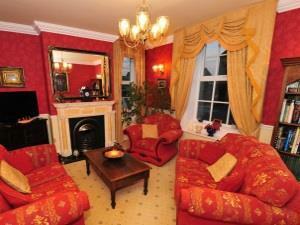 Bev and Chris aim to offer a warm and comfortable environment in which to relax and enjoy your stay.